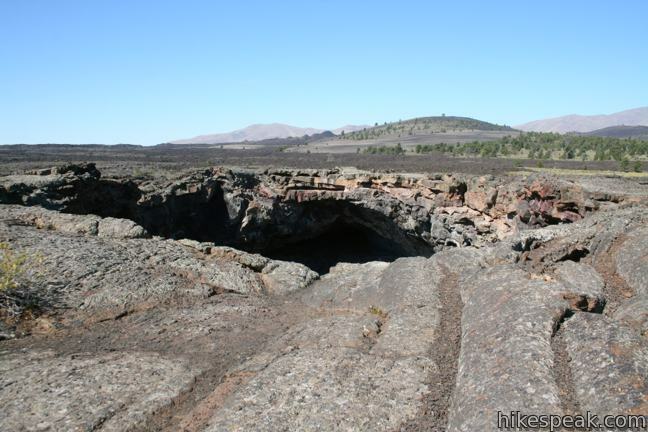 The Craters of the Moon landscape is more than just surface volcanic features. Below ground there is a dynamic underground world where fiery rivers in hardened, self-insulating tubes once flowed for miles without losing heat. Indian Cave is the largest tube, measuring 30 feet tall and 800 feet long with several massive skylights the provide so much sunlight, you don’t need a flashlight. That is not the case for the other three tubes. The entrances to Boy Scout Cave is so small you have to crawl inside and barely have room to stand. The final tunnel on the trail, Beauty Cave, has a walk-in entrance leading to an intensely dark corridor. 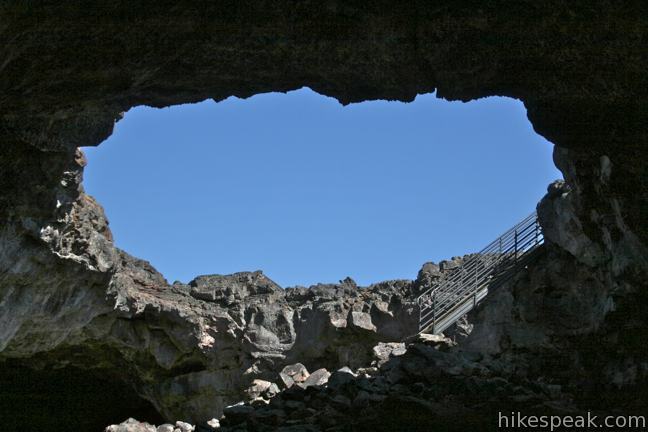 Check out all four caves on this fun hike above and below ground in Craters of the Moon National Monument. 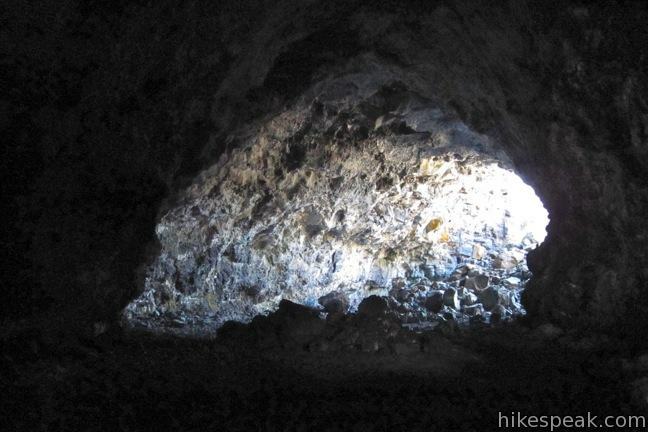 Pack a few strong light sources with you as you head out on Caves Trail. A hat and warm clothes are recommended if you plan to spend a lot of time below the surface. In an effort to halt the spread of white nose syndrome, which is killing bats across America, a permit is required to enter the caves. 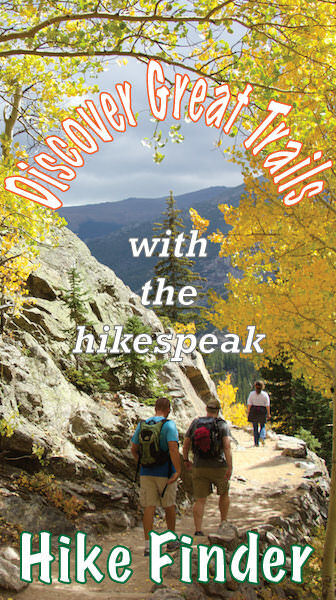 Pick up the free permit from the park visitor center before starting your hike. 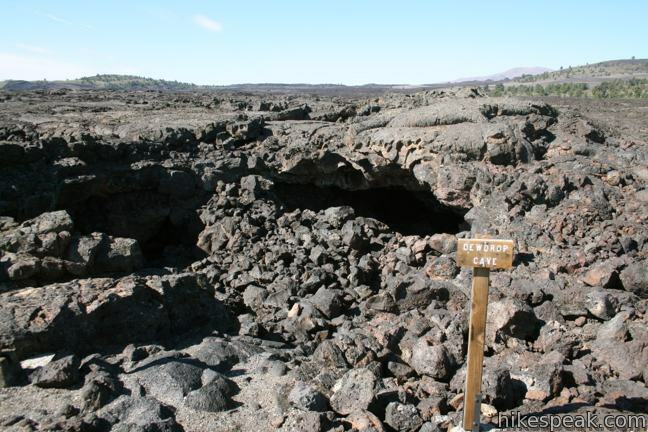 Do not enter any cave at Craters of the Moon without first obtaining a permit. Do not use equipment, gear, or clothing in western caves or mines that has been used in caves or mines east of the Rocky Mountains. Decontaminate equipment, gear, and clothing between caving sites. Use decontaminated equipment, clothing, and decontamination procedures when entering mines and caves. Report unusual bat behavior to a park ranger. Unusual behaviors may include daytime flight, especially during very cold weather. Report dead or dying bats found on the ground, trees, or buildings. Never handle sick or dying bats. 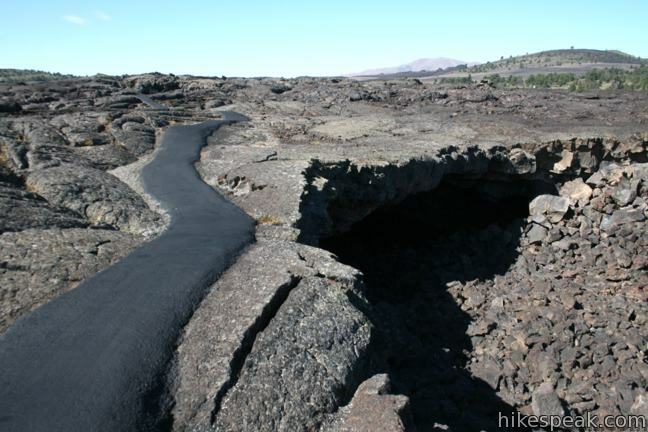 With that out of the way, begin hiking up the paved trail across the surface of the lava flow. 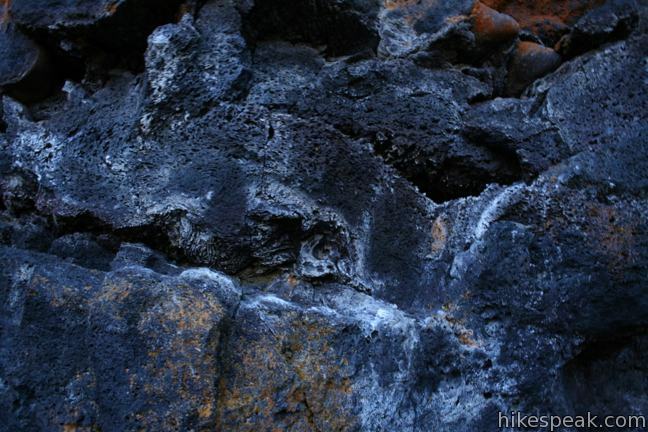 The surrounding basalt rock is smooth, with a rippled and rolling surface broken up by jagged cracks caused by collapses in the surface. 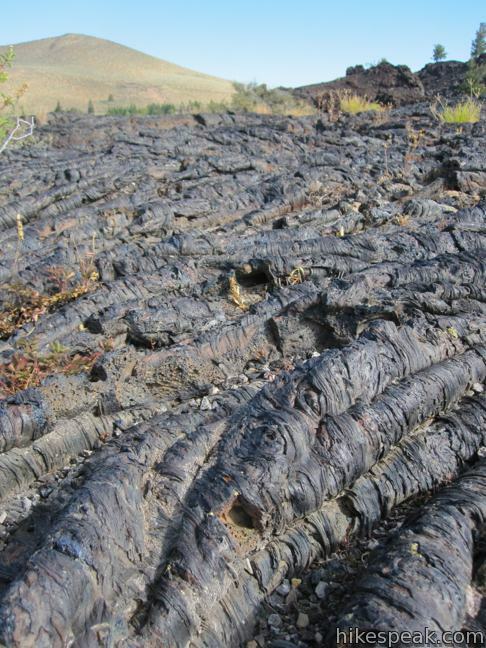 Lava flowed throughout this area for an extended period, resulting in the surface of Pāhoehoe lava and the tubes below. Each of the cave entrances is well marked. The first cave you will reach is Dewdrop Cave. This tiny cave is a good appetizer for things to come. You can access two pockets of the cave on opposite sides of a round collapse. If you are feeling up for it, go ahead and climb out the skylight on the west side of the cave. 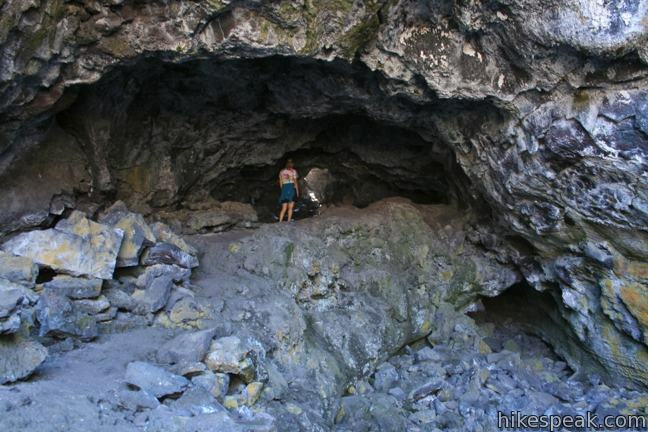 Remember that your safety is your responsibility, and these caves may contain unstable ceilings and falling rocks. Just past Dewdrop Cave, and 0.4 miles from the start, you will reach a split in the trail. Boy Scout Cave and Beauty Cave are straight ahead, while Indian Tunnel is to the right. The paved path to Indian Cave passes a massive collapse in the crust and ends at metal steps dropping into the massive 30-foot tall 50-foot wide tube. At the base of the steps, turn left and begin exploring the tunnel. There is a worn track running across the floor, so it would be hard to take a wrong turn (which would quickly dead end anyway). Piles of basalt boulders spread across the tunnel floor, and are the remains of breakdowns that once hung on the ceiling of the tube. 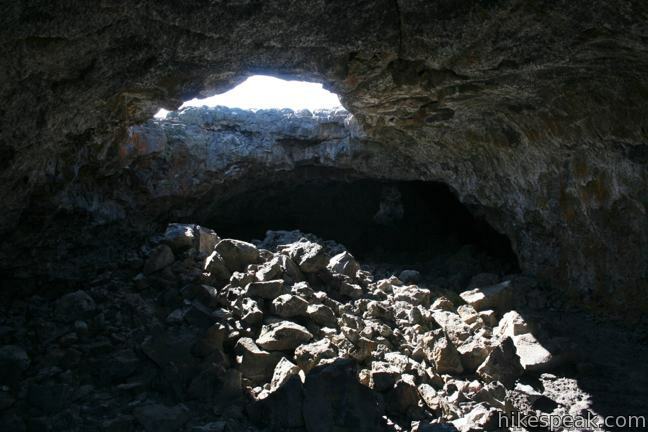 Three large collapses beyond the cave entrance, along with smaller skylights, keep the inside of the tunnel well lit, allowing you to fully examine the bizarre shapes and colors in the lava walls. At the end of the tunnel, the walls narrow and bend to the left. Here you will face a short dark passage, climbing over boulders to return to the surface. 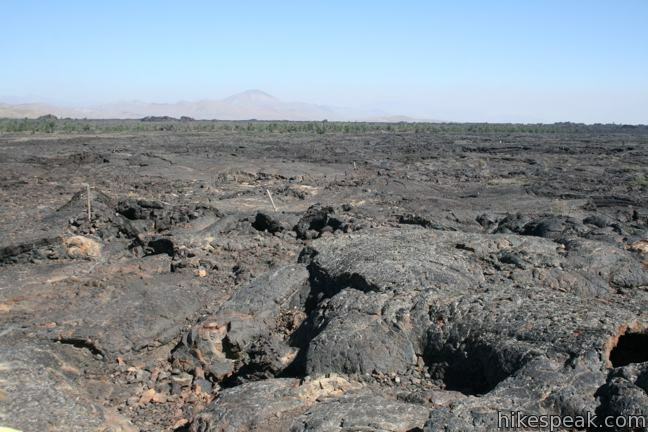 From here, follow cairns and posts across the top of the flow leading back to the trail, a 0.15-mile walk right across the lava field. Hike back down the pavement to the junction and turn right. You will reach the entrance to Boy Scout Cave on the way to Beauty Cave at the end of the trail. There is a collapse at the center of this tube, creating two small crawl entrances going in opposite directions. One is a four foot crawl space and the other is an even small three foot opening. Beyond the smaller entrance there is a compact chamber, followed by a one-foot crawl leading to a rear entrance for the cave. 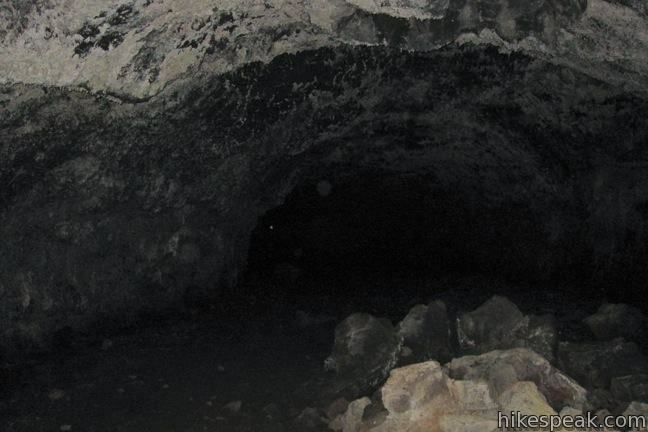 This cave is intensely dark with a layer of ice covering some cold wet corners. 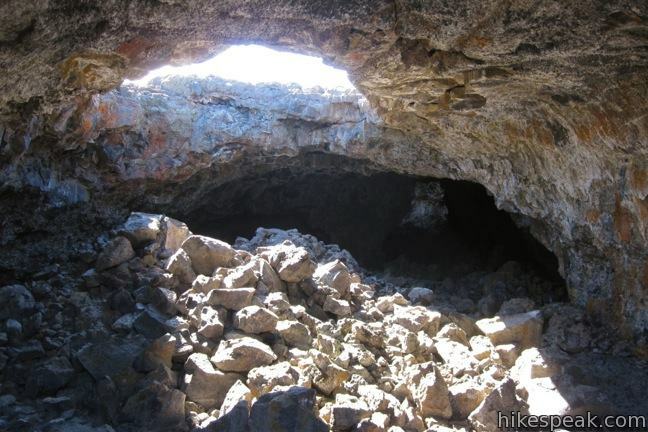 This is the most adventurous cave, definitely not for those afraid of the dark or tight spaces. Beauty Cave is much easier to enter. 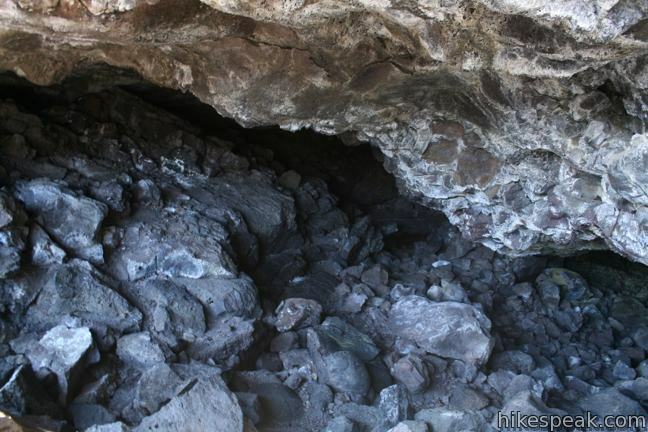 From the end of the pavement, step down the boulders and through the entrance of a collapse in the tube. The ceiling of this cave is ten to fifteen feet tall and the walls are about twenty feet wide. As you walk in from the large lit opening, the cave quickly turns dark and cold. 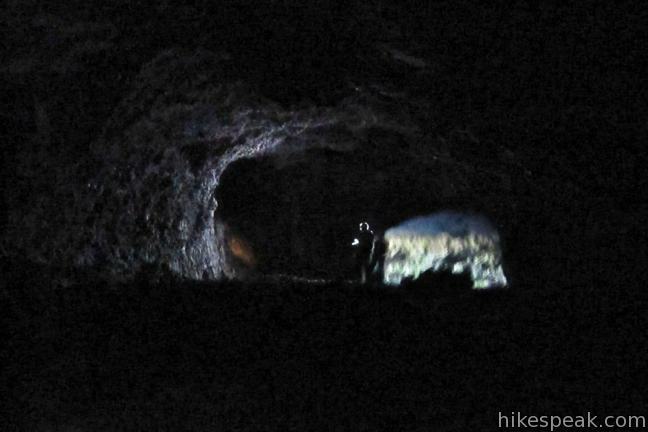 You will definitely need a flashlight as you push farther back in the pitch black tunnel. Cave slime glistens on the wall of the cave, and the air is cold enough for you to see your breath. It can sure be a relief from the temperature on the surface, but eventually you will have to turn toward the light and return topside. Do not explore past a sign at the back of the chamber that warns about unsafe ceilings. Hike 0.3 miles back to the Indian Tunnel junction and continue another 0.4 miles back to the trailhead. It is an easy walk back after the fun exploration. 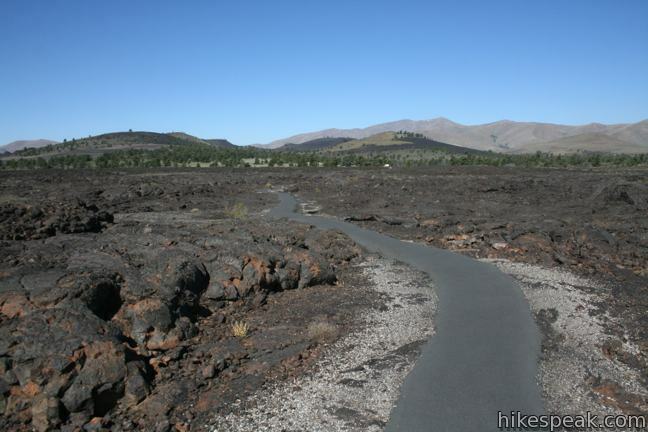 There is an $8 national park entrance fee to reach this trail in Craters of the Moon National Monument, and a permit is required. Dogs are not permitted. A map and guide to the caves is available at the visitor center and the trailhead for fifty cents, and is a useful but not essential tool. The guide provides illustrations of each cave that includes useful details like ceiling height and locations of breakdowns and skylights. To get to the trailhead: Whether you approach Craters of the Moon from Blackfoot along Interstate 15 to the east or from Twin Falls along Interstate 84 to the west, it is an approximately 90 minute drive off the freeway to Craters of the Moon National Monument, located along US Route 20/26/93 (three routes in one), 19 miles southwest of the town of Arco and 24 miles northwest of the town of Carey. Turn into the main entrance for the monument on the south side of the road and proceed 11 miles into the park to the trailhead. Drive two miles to the split in the loop drive and continue 2.4 miles to the turnoff for Caves Trail on the right. The hike begins from the end of the parking lot. Or view a regional map of surrounding Idaho trails and campgrounds. 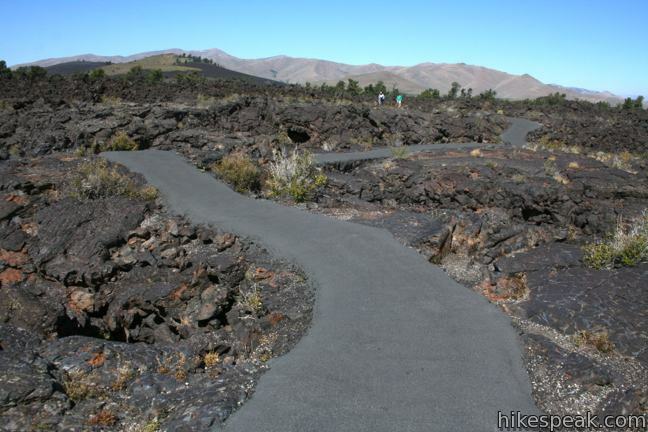 This half-mile hike summits a cinder cone at the center of the scenic loop drive in Craters of the Moon. 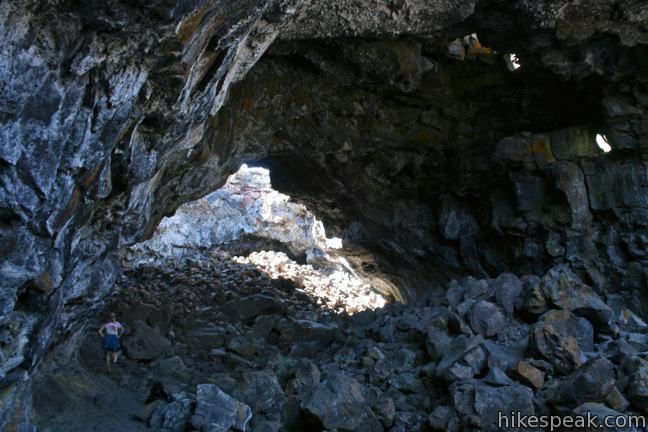 This seasonal 51-site campground sits on a lava field near the entrance to Craters of the Moon National Monument.